Celebrate the BSA’s 109th Anniversary in February 2019! The Boy Scouts of America was founded on February 8, 1910. To celebrate, Montana Council offers an Anniversary Month Contest during the month of February. Email Michelle (michelle.malin@scouting.org) no later than Thursday, March 14th the activities your unit completed. 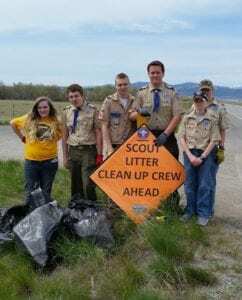 The Units that submit the best information (photos, news articles, or videos) about their activities will receive special awards, including paid luncheon tickets for two leaders and two Scouts to Montana Council’s Annual Awards luncheon on Saturday, April 27, at Fairmont Hot Springs, a Troop plaque and Scout Bucks for each registered youth! In an effort to thank their community and invite the original Scouts of the Pack to their Blue and Gold Banquet, Pack 4944 was featured in an article in the local paper. Wore uniforms to Church on Scout Sunday. We look forward to your Unit’s activities for Montana Council’s Anniversary Month Contest in February!